Down in Southern California, we've enjoyed a nice little taste of warm weather with a heat wave this week. Beautiful weather combined with swimsuits hitting stores made me more excited than ever for spring and summer fun! Luckily, spring is right around the corner. And hopefully with it, warmer weather promoting outdoor entertainment. So why not start preparing for springtime fun? At least for me, outdoor activities are nothing without good music to fuel the fun. Portable speaker systems, like the ones from GOgroove, are the ideal solution, providing great sound from small, lightweight designs. The Panda Pal and Koala Pal are great for kids, or for the kid in you, playing audio from any device with a 3.5mm outlet. Although the Panda Pal and Koala Pal are both powered through USB, they also make great speaker systems when powered by 3 AAA batteries. The TuneStyle Portable Minispeaker is also a favorite, with a color-wash grill that adds a fun dash of color to this compact speaker. 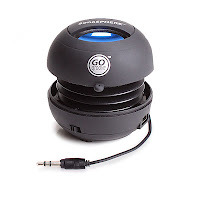 Also powered by USB or with 2 AAA batteries, this small speaker system is perfect for use as a desktop speaker or to take with you to the pool, camping and on picnics. The GOgroove SonaSPHERE is my favorite speaker to use when I'm enjoying the outdoors on a nice day. With an internal battery, the SonaSPHERE can continuously play audio for 2 to 3 hours on a single charge. The SonaSPHERE's body expands for increased sound fidelity, and a linkable design allows you to connect several SonaSPHEREs together for increased sound. Bluetooth speaker systems are also great to use when you're out and about, connecting to compatible devices wirelessly. This BOOMbar will connect to any Bluetooth enabled device and play audio from up to 75 feet away! Get rid of that old jumbo boom box and upgrade to a portable speaker system to play your springtime fun playlists.